Free download Winamp latest version. It is initially developed by Nullsoft now owned by AOL. Winamp media player is available for Windows, Mac OS and Android based devices. If you are looking for an audio player for your PC, MAC book or mobile phones then winamp is perfect audio player. Winamp is very old audio player. It was released in 1997 for windows. At that time, it was considered the only audio player for computer systems. Winamp supports almost all audio formats such as MP3, MPEG-1, ACC, MIDI, M4A, MOD, WAV, OGG, WMA and many more. You can even play the audio from all video files. It will play the audio only without the video. 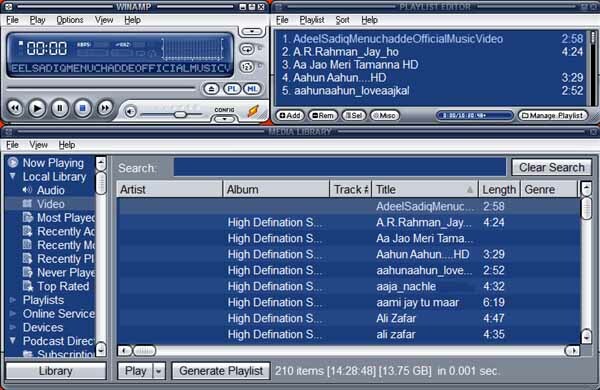 Winamp media player is very light and suitable for your PC or mobile phone. Downloading and installation of Winamp is very easy and simple. First of all, download the setup file from the download link given below. After downloading, install it on any of your operating system such as Windows XP, Windows Vista, Windows 7, Windows 8 or Windows 8.1. You can add a shortcut to desktop, quick launch bar or can uncheck the options. Now you can choose the skin of your choice. You will see a list of skins and the preview. There are Bento Skin, Bento Skin (Large), Bento, Big Bento, Winamp Classic and Winamp Modern. After selecting your desired skin click on Next. Now you are asked for association with winamp. You can select the options of your choice and finish the process. Winamp is ready now. At the top left, you will see the real Winamp control menu. It will show the current audio progress, volume control, pause, stop, play and forward buttons and menu. Top right side has playlist editor. You can add new items, rename any of the item in the current list.